I decided that to make this worth knitting, I wanted it to be as long as my favourite pashmina and my lovely Eritrean scarf. 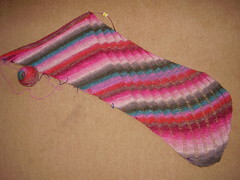 So I went to Sew Creative yesterday for a fourth skein of the Noro. Afterwards, as I was knitting and then winding my new skein onto the existing ball, a fellow twenty-something stopped by my table in Borders to find out where I'd bought the yarn. I felt rather chuffed to be an advert for my favourite LYS !! The dropped stitch part of this pattern is rather addictive; I love reaching each row 8 of the 12 row repeat just so I can pull some more stitches out and add to the wavey texture.